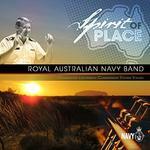 Spirit of Place / Royal Australian Navy Band, conductor Lieutenant Commander Steven Stanke. Mao's last dancer : suite / Christopher Gordon. Arranged by Lieutenant Commander Steven Stanke. 1 May 09: City Hall, Brisbane. Featuring Queensland Orchestra, Marc Taddei.